As part of Hizb ut-Tahrir's global campaign titled “The Penultimate Call…from Hizb ut-Tahrir To the Muslim Ummah in general…and its People of Power in particular,” Hizb ut-Tahrir Wilayah Pakistan organized a public reading of the call in Pakistan's largest city and financial centre, Karachi, home to 22 million people on the first Friday of Ramadhan, 19 June 2015. 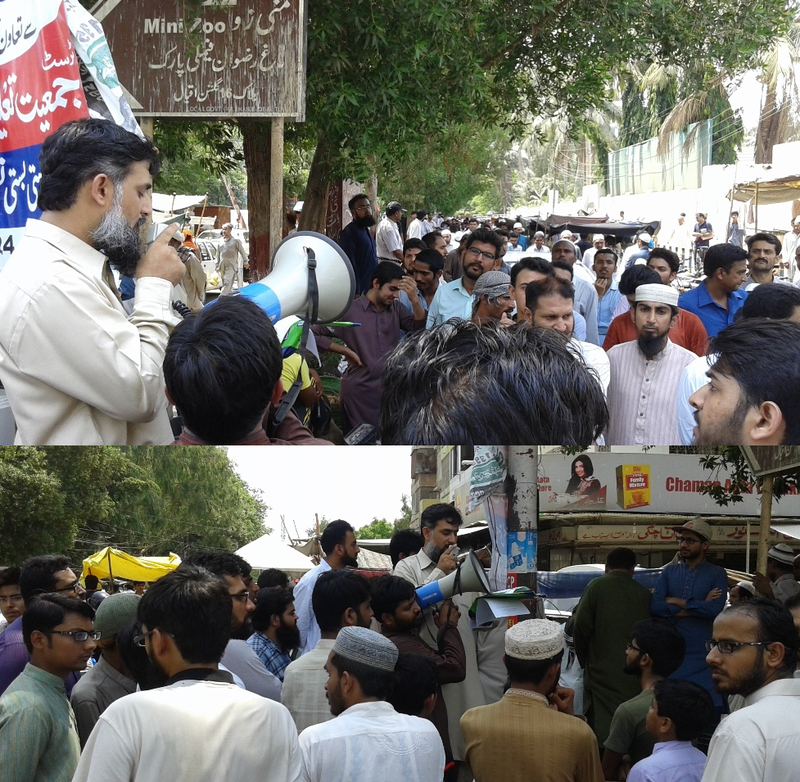 Despite the intense persecution by the Raheel-Nawaz regime against Hizb ut-Tahrir, the Deputy to the Spokesman of Hizb ut-Tahrir in Pakistan, Shahzad Shaikh, addressed the Musaleen in the largest mosque of Karachi's Gulshan-e-Iqbal region, Bayt ul-Mukarram. “This is the penultimate call we direct to you, seeking your support, so join those who have preceded you in supporting us. We extend to you our hands, so grab them and join the people of influence who have already pledged their support to us, for the caravan is about to set off so join the journey. They say, ‘When will that be?’ Say, ‘Perhaps it is near. "کافر استعماری ریاستیں ہم پر ایسے ٹوٹ پڑی ہیں جیسے کُتے اپنے شکار پر ٹوٹتے ہیں۔ ہماری زمینیں آج ہر لالچی ذی روح کی ہوس کا نشانہ بنی ہوئی ہیں اور ہر بدنیت شخص ان کا استحصال کرنے میں لگا ہوا ہے۔ یہ اس طرح تقسیم ہوگئی ہیں کہ ان کو یکجا کرنے کی کوئی چیز موجود نہیں۔ بلا خوف و خطر ہمارا خون بہایا جا رہا ہے، ہمارے وسائل لوٹے جا رہے ہیں اور ہماری زمینوں پر ہر طرف سے حملے کیے جا رہے ہیں یہاں تک کے امت کے دل پر بھی"